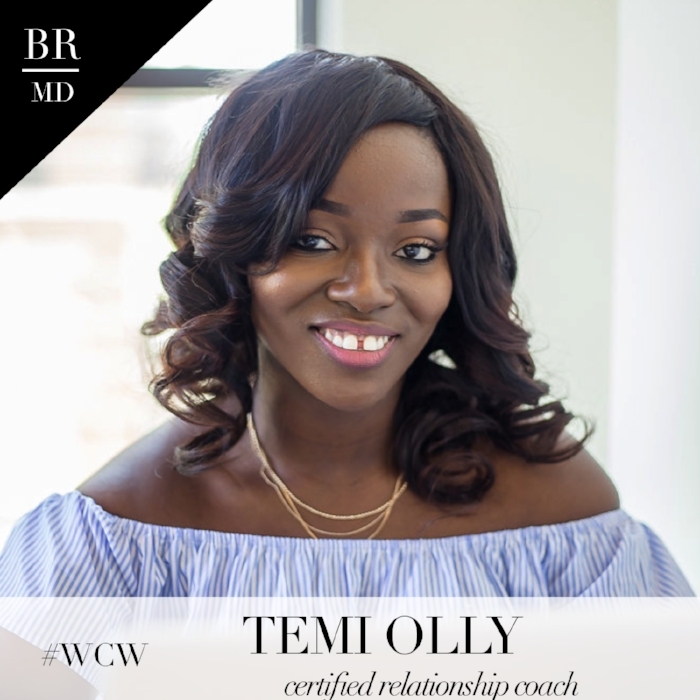 This week, we are so excited to highlight certified relationship coach, Temi Olly. We asked her to share with us her story and her thoughts on success. How did you get started in your field/career? I got a BSc in Business Administration and eventually got into the IT field due to my love for Software Development. I have had the opportunity to not just grow in the field but also train a few people who have gone on to do great for themselves. I was and still am happy in the IT space but I felt like something was missing. I felt like I needed to figure out my gift/purpose. I once heard Steve Harvey say, "your gift is something that comes easy to you" so I decided to do some soul searching to figure out what my gift was. I prayed about it and took a look at the pattern in my life and it was then I realized a trend. I noticed I had people who seem to come to me or were referred to me for advice in their personal and professional relationships and through traumatic situations. I noticed I was working with people who were struggling to get over situations like breakups, divorce, sexual assault or people who were simply trying to figure their love life out. I want to point out that I do not think that they came to me because they felt I had it all figured out. One thing that all of them said was they found talking to me to be easy, enlightening and always helped them see a way through their situations. That was when I realized that my gift/purpose and passion is to help coach people through life and relationship. So I enrolled at for a Certificate in Relationship Coaching at the World Coach Institute and started my practice. When I am not having client sessions, I’m teaching a class in a Pre-Marital Course or speaking at an event. If you could tell your younger self one thing to jumpstart her career, what would it be? It’s hard to narrow down to one thing so I’ll do the top 2. The first would be you don’t have to have all the answers to get started, just figure out what you can and take the first step, enjoy the journey and be committed to learning and growing. Second thing would be not everyone will connect with you and that’s fine. Learn to be okay with that, for those who don’t connect with you take their constructive criticism and make changes where necessary but don’t be so focused on who is not for you that you lose out on who’s on your team. Understand that the world needs what you have to give so don’t hold back! Temi Olly is a Certified Relationship Coach that helps people who are trying to build and strengthen their relationships, people who want to figure out how to stop making the same dating mistakes, and people who are on a journey to making themselves better!